If you grew up loving Big Trouble in Little China or Hong Kong Phooey then you will definitely want to check out this slot from online slot developer NetEnt. Thunderfist is a light-hearted twist on a Chinese martial arts theme where the characters in the slot can pull off a horse stance with a beaming grin whilst also managing to award you with some great prizes. This slot is a 5-reel, 243-ways-to-win online slot that is slightly different from your average NetEnt slot. It is possible to win up to 1,215,000 coins. Symbols across the reels are made up of five martial artists in different kung fu positions as well as regular symbols that are made out of bamboo. 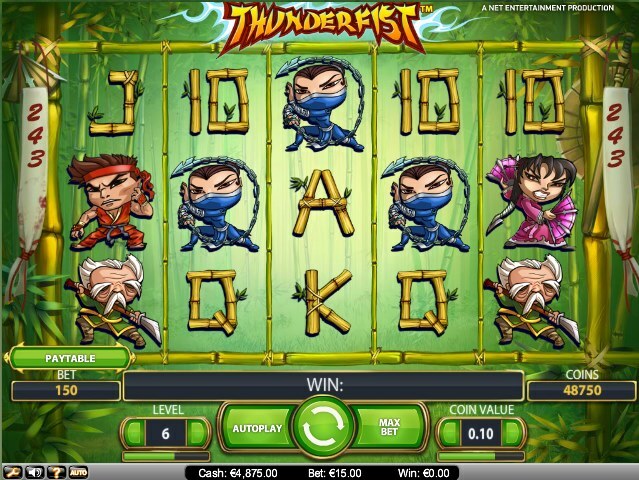 Thunderfist comes with the distinctive Stacked Wild that is active during the regular gameplay and free spins bonus round. This is a fantastic inclusion in this slot because, along with the 243 ways to win, it opens up a wealth of possibilities to win. The free spins bonus round is where the real action kicks off in this slot. It is triggered when you hit three or more golden dragon medallion Scatters across the reels. If you hit three of these Scatters you will win 10 free spins, if you hit four Scatters then you will receive 15 free spins and if you hit five Scatters then you will be awarded 20 free spins. There is also the chance to multiply your winnings by up to 5x if you hit the Multiplier symbol across the reels during the free spins. Thunderfist is a game that offers a lot more than you initially think. When I heard that NetEnt had released a Chinese martial arts slot called Thunderfist, I imagined a stereotype-filled slot that did not take itself seriously and was more a token release. I couldn’t have been more wrong. 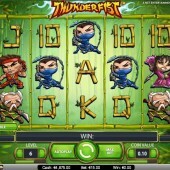 Thunderfist is well worth the time to play and the free spins action is frantic to an unrivalled level. If you liked Novomatic's oriental-themed Katana or the Bruce Lee slot from WMS Gaming then you will love this.